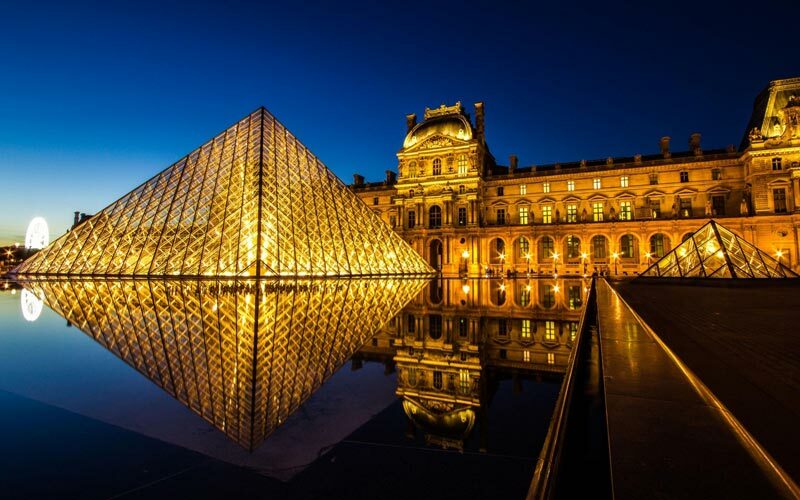 Not so long ago France’s principal attractions for tourists were Paris and the Riviera, and relatively few holidaymakers explored the rest of the country. Nowadays things are very different. The Mediterranean resorts still attract their devotees, but tourists now also realize how much the rest of France has to offer. Its historical monuments range from prehistoric cave paintings and drawings, Greek and Roman settlements on the Mediterranean coast, the Romanesque and Gothic churches of the medieval period and the palaces of the absolute monarchy to the buildings of the present day. And no less varied than the architecture are the landscapes of France – the rugged coasts of Brittany, the gentler shores of the Mediterranean, the wide valley of the Loire with its chateaux, the volcanic terrain of Auvergne with its extinct volcanoes, the splendors of the Alps and the Pyrenees. France is the largest country in Europe (excluding the former Soviet Union), though only a fourteenth of the size of the United States. It has a total area, including Corsica but excluding the overseas departments, of 547,026 sq. km/211,207 sq. miles – more than twice the area of the United Kingdom. More than in any other country the tourist visiting France, wherever he goes, will be confronted with the fact that culture and art have from time immemorial played a central role in life. Not only in Paris and the large towns but also in tiny villages and remote corners of the country evidence of an active cultural consciousness can be found. French art finds expression in the caves of south-western France, in the Romanesque churches of Burgundy and the cathedrals of the Ile de France, in countless museums and art galleries, and in literature. Any journey in France should therefore also be, in greater or lesser degree, a cultural journey. Often art forms a counterpoint to the landscape: one can be enjoyed without neglecting the other. It is clearly impossible in a visit of only a week or two to get even a cursory view of French art: it is a good idea, therefore, for tourists to limit their horizon, either to a particular region or to a particular field of interest. Error: Error validating access token: Session has expired on Tuesday, 26-Feb-19 11:00:00 PST. The current time is Saturday, 20-Apr-19 19:43:10 PDT.